Although most people develop and grow 32 permanent adult teeth, many times their jaws are too small to accommodate the four wisdom teeth. 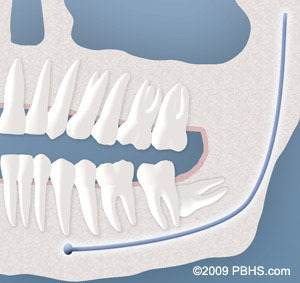 When inadequate space prevents the teeth from erupting they are called impacted wisdom teeth. This indicates their inability to erupt into the proper position for chewing and cleaning. We will need to see you for a consultation to determine if you will benefit from wisdom tooth removal. A special x-ray of your mouth and jaws (panorex) will be taken to determine if your wisdom teeth are impacted, if there is room for them to erupt, and how difficult it will be to have them removed. 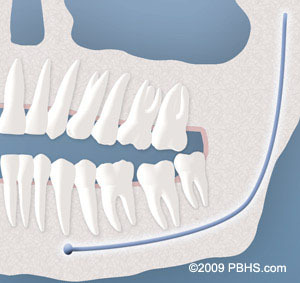 Soft Tissue Impaction: There is not enough room to allow the gum tissue to retract for adequate cleaning of the tooth. Partial Bony Impaction: There is enough space to allow the wisdom tooth to partially erupt. However, the tooth cannot function properly in the chewing process, and creates cleaning problems, among others. Complete Bony Impaction: There is NO space for the tooth to erupt. It remains embedded in the jaw bone or if even partially visible requires complex surgical techniques for removal.The impacted wisdom tooth may also be in an unusual position and difficult to remove. This situation can also arise when the shape or size of the jaw bone and other facial structures make removal of this tooth significantly more complex.